There are villains, and then there’s Thanos. The Mad Titan is sure to be the bad guy on everyone’s lips when Avengers: Infinity War rolls around on May 4, 2018. Judging by the directors’ comments, though, I don’t think we’re quite ready for just how much Thanos is going to dominate the third Avengers movie. Thanos may bear more than a passing resemblance to a squashed grape, but he’s not to be trifled with. Speaking to Sina Weibo (H/T ComicBook.com), co-director Joe Russo was asked which character he’s excited for fans to see. His answer was unequivocal: Thanos. "I'm most excited for the audience to learn about [Thanos]. I think he's a very interesting and complex villain. That's why I like him. That's why I'm excited for the audience to learn about him. I think his motivations, albeit psychotic, are compelling,” reveals the younger Russo brother. 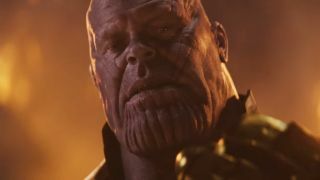 Thanos’ one-track mind on hunting down the remaining Infinity Stones is surely going to be riveting but, if you want to read between the lines within Joe Russo’s words, the Gauntlet-wearer will completely dominate proceedings: “I think that in a lot of ways this is his movie, so it's going to be very interesting to see how people respond to Thanos in the film," he says. A lowkey Thanos movie inside an Avengers movie? Now that is interesting. Marvel might have finally fixed their big, bad Big Bad problem. I mean, sure, the decade-long build-up to his arrival helps, but having a movie revolve around Thanos (which makes a whole lot of sense when there’s a fourth Avengers flick just around the corner) means everyone – even casual Marvel fans – will know straight away that he’s a big deal. Well played, Marvel. Well played.